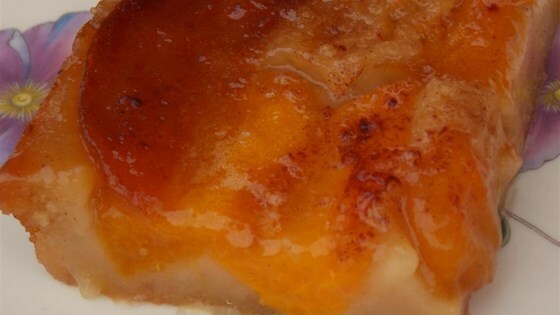 "I have some amazing friends on the East coast that shared with me their mom's peach cobbler. I have never liked peaches no matter how prepared. But I make this at night and chill it overnight for a delicious and quick breakfast. The only change I made was adding cinnamon. We substituted the regular sugar with Splenda®, so my son could eat a big piece." Preheat oven to 375 degrees F (190 degrees C). Melt butter in a 9x13-inch baking dish in the preheating oven. Mix flour, sugar, and milk together in a large bowl; pour into baking dish with melted butter. Spread peaches over the batter and sprinkle with cinnamon. Bake in the preheated oven until cobbler is bubbling and lightly browned, about 45 minutes. Let cool about 15 minutes before serving. Absolutely! Cut the butter to 1.5 STICKS...had to ladle off 3/4 C while baking....still was VERY buttery but chewy crust like we like, very good. I made this and I believe that there was too much butter. Was it perhaps supposed to be 1 and 1/2 STICKS butter instead of cups? I would say it's a bit greasy and I only used 1 stick of butter ... but it was still really good fam and I enjoyed it. ? Even 1-1/2 sticks was too much. I did not care for this at all. 0 stars for me. Sorry. WAY too much butter - thanks to the other reviewers for the heads up. 1 1/2 STICKS of butter is more than enough and you could probably use just 1 stick of butter.